Any MSU member (an undergraduate student enrolled in 18 units or more) may run for the election of a Vice Presidential position or for the role of Speaker. Elections will be held at the Student Representative Assembly meeting of Sunday, April 7, 2013 beginning at noon in Council Chambers (Gilmour Hall 111). You need only make your presence known at this meeting if you wish to be considered. 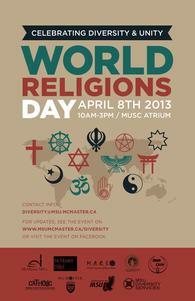 World Religions Day 2013 will be held on April 8th from 10AM-3PM in the MUSC Atrium. Join MSU Diversity Services along with many wonderful faith-related clubs in order to explore the diversity of faiths at McMaster University and celebrate unity amongst individuals of all spiritual beliefs! Food, music, interactive activities and information booths will be features of this unique event. The Emergency First Response Team (EFRT), the MSU's world-class first responders won the EMS Skills Competition at the Annual National Collegiate Emergency Medical Services Foundation (NCEMSF) Conference. Over 1,000 representatives of campus-based EMS organizations from 102 colleges and universities across the U.S. and Canada attended the 20th Anniversary Conference in Washington, DC. March 20th witnessed the 33rd annual Student Recognition Night, celebrated in CIBC Hall of MUSC. Student Recognition Night celebrates the hard work done by students and student groups to improve the lives of McMaster undergrads. The Student Walk Home Attendant Team (SWHAT) is a free MSU service developed to ensure that students can get home safely after dark. This month, SWHAT is conducting a “walkathon” to raise money for the Sexual Assault Centre for Hamilton and Area (SACHA) and its new on-campus initiative: It’s Time...to End Violence Against Women.